A huge flock of birds is coming to Harlem and Washington Heights, and they need places to land! A recent study from the National Audubon Society found that nearly half of all North American bird species face dire threats from global warming. 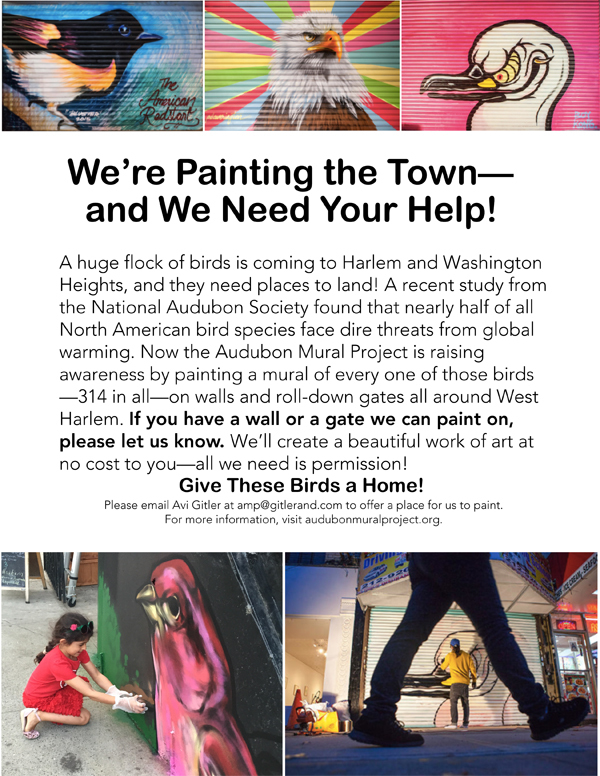 Now the Audubon Mural Project is raising awareness by painting a mural of every one of those birds—314 in all—on walls and roll-down gates all around Harlem and Washington Heights. If you have a wall or a gate they can paint on, please let them know. They will create a beautiful work of art at no cost to you—all they need is permission! Give These Birds a Home!! Please email Avi Gitler at amp@gitlerand.com to offer a place for us to paint. For more information, visit audubonmuralproject.org .